Yes, finished! My latest painting ‘Fryslân’. In a couple of weeks this painting will move to… Australia! The theme is ‘Fryslân’, can you detect all the Frisian elements? Scroll down to find out which 17 theme’s I painted. It took me 47 hours to design and paint this painting. I’m very happy with the result! 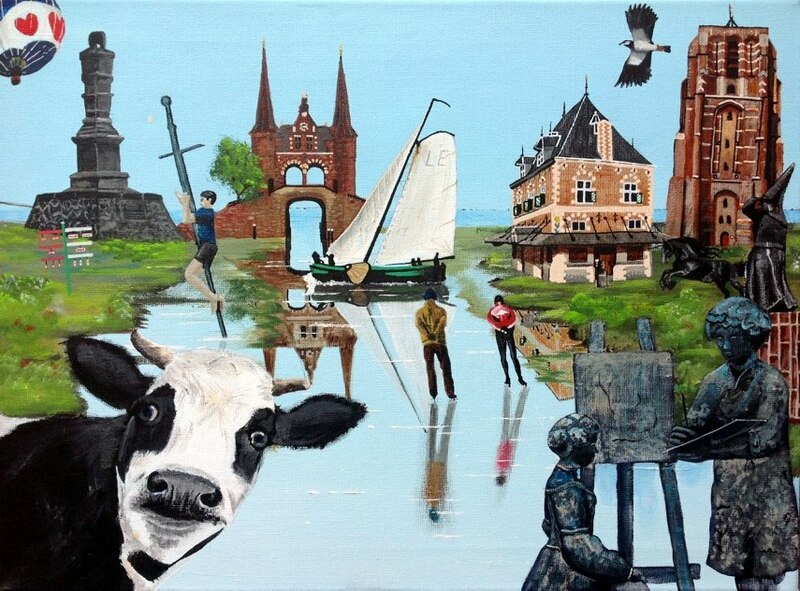 In the painting you can find: a Frisian cow (although a farmer told me it’s a ‘Groninger blaarkop’, damn), a Frisian flag, the statue ‘De stenen man’ (man of stone) in Harlingen, balloon flights in Joure, kaatsen and fierljeppen (both Frisian sports), the sword of Big Pier, the waterport in Sneek, the lady of Stavoren, a Frisian horse, egg searching, statue of Rembrandt van Rijn and Saskia van Uylenburgh (they wed in Sint Annaparochie) and the Wadden. Your painting is amazing! So clear, light and interesting. Keep going!